TL; DR: Great hires make great companies. With a shortage of skilled labor, it’s important for companies to be more aggressive in recruiting new talent. Lever was founded to give businesses an edge in bringing in the best candidates. By combining big data with marketing strategies, Lever keeps employees involved in the hiring process in sync and makes recruiting new candidates a team sport. Add-on products include Lever Nurture, which helps in proactively sourcing candidates, and Lever Talent Intelligence, which provides powerful visual dashboards to assist companies in drawing insights from their data and optimizing the hiring process. Lever gives businesses a competitive advantage over rival companies when it comes to recruiting talent by supercharging the hiring process with intuitive, easy-to-use software. In the modern job market, skilled labor is hard to come by, forcing companies to aggressively compete for talented employees. Wooing the right candidate has become similar to major college football recruiting. When the top programs in the nation all want the same five-star quarterback, they aren’t waiting for the player to ask them if he can join the team. They are contacting him whenever possible, sending assistant coaches to his high school games and practices, and joining his mother at church on Sunday. This all-hands-on-deck recruiting approach is now becoming increasingly common in other lines of work. In essence, recruiting and hiring five-star candidates has become a team sport with multiple employees joining in to sell the job and the company to the prospective employee. Leela Srinivasan, Chief Marketing Officer at Lever, told us about how her company provides software that helps businesses adapt to modern hiring. 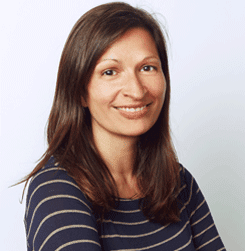 We recently spoke with Leela Srinivasan, Chief Marketing Officer at Lever. She told us that when Lever founders Sarah Nahm, Nate Smith, and Randal Truong were starting their software company in 2012, they asked dozens of business leaders what their biggest challenge was in scaling up. The overwhelming response was that hiring was slowing growth because the software didn’t support the modern hiring process. So the three founders and their fledgling team tried a unique experiment. Using this information, the team designed Lever from the ground up to support modern hiring practices, seamlessly merging customer relationship management (CRM) with applicant tracking system (ATS) technology to streamline the hiring process. Four years later, the San Francisco-based company has more than 1,100 corporate customers, a group that includes online retailers such as ModCloth, Everlane, and Tuft & Needle, as well as e-commerce providers such as Shopify, Shopkick, Wish, and Paymark. 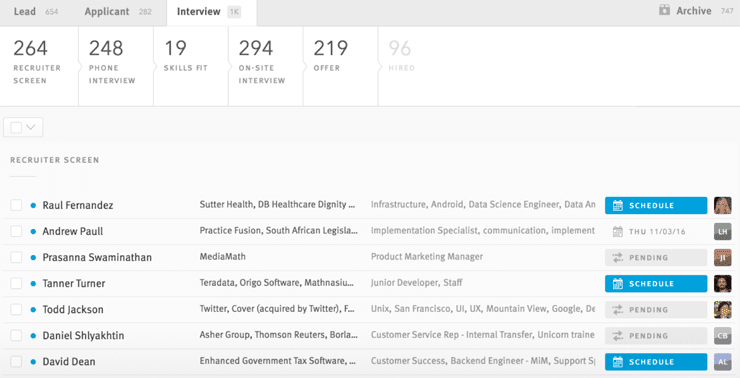 Lever’s users have sourced and reviewed millions of candidates through software that supports using marketing strategies to better appeal to top talent. Hiring managers and recruiters play important roles within companies. The future success of a company can often depend on finding the right fit for each position. With Lever Hire, hiring managers can focus on the bigger picture and automate the minutiae that occupies so much of their time, freeing them up to create a customized application experience for each candidate. Lever Hire is a fully featured applicant tracking system where companies can set up their candidate pages, run all of their interview processes, manage their candidates, and organize feedback from employees and candidates. It includes a browser extension that allows for one-click referrals so your employees can start finding candidates to add into your pipeline with one-click integrations for job boards such as Glassdoor and LinkedIn, and the ability to reach countless more through JobTarget. An important feature in Lever Hire is two-way email sync, which essentially creates a shared inbox so every employee working on recruiting is on the same page with each candidate. The interview process is also made more efficient with a drag-and-drop interface that syncs with your calendar so you can find the best time to set up interviews. If all goes well with an interview, companies can even extend an offer through Lever and get the offer approved internally, thanks to an integration with DocuSign, before it goes out to a candidate. Some companies have more sophisticated hiring procedures, and Lever offers add-on software to support the next level of hiring processes. Introduced in 2016, Lever Nurture was designed to fit a growing trend of proactive sourcing for harder-to-fill roles. Persistence has become essential in convincing top talent to consider joining your company. 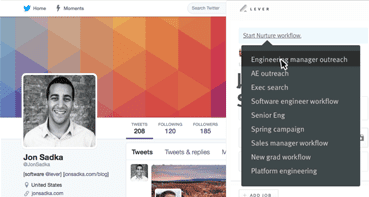 Lever Nurture uses browser extensions and integrations to simplify the process of setting up a pipeline. Lever Nurture gives companies the tools to set up workflows in a templatized way so they can decide how many touchpoints they want to have with potential candidates and when they want those to occur. They can choose to send messages from different employees to try to be more impactful. Big data is a growing trend in virtually every industry. Lever has developed rich analytics capabilities to help track the effectiveness in a recruiting campaign through robust reporting that’s built into the product. This helps companies better craft their strategies to focus on particular job boards and find out which hires turned out as positives through deconstructing data. 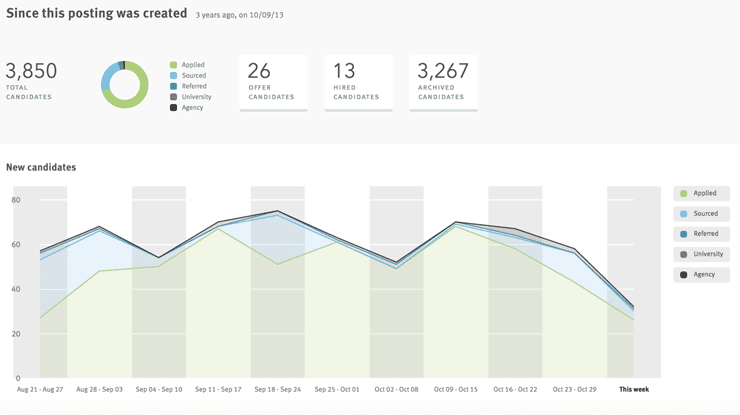 Lever Analytics takes a visual approach to recruitment data that helps hiring managers make sense of their strategies. Capturing meaningful insights from vast amounts of data can be confusing. Through an integration with Tableau, a popular business intelligence tool, Lever launched Talent Intelligence to provide a customizable, highly visual analytics module for customers. “We’ve built out some very intuitive dashboards for teams to use and slice and dice their own recruiting data more granularly to get to all sorts of facts and figures, including helping them understand the productivity of the recruiting team so they can think about workload across recruitment,” Leela said. The goal is to better understand what makes a quality hire through data and developing a thorough system that leads to what Leela called “a Holy Grail of hires.” Sometimes there are signs during the interview process that can predict whether a candidate will be successful at a company, and the goal is to use data to look for trends that lead to great hires. Companies, especially those employing white-collar professionals, are finding it increasingly difficult to fill positions with skilled workers. The National Federation of Independent Business reported in October of 2016 that 48 percent of businesses looking to hire reported few or no qualified applicants for unfilled positions. This shortage has driven the need for proactive recruitment, which has become a mainstream way of bringing new talent into a company. The internet has transformed the way that people think about finding work and the way that companies find talent, and companies have had to become much more aggressive in recruiting hires. Social media platforms and websites like Glassdoor have led to a level of transparency where corporate brands are intertwined with company culture, and highly skilled candidates will often find out what it’s like to work for a company before they even consider applying. So, in a sense, companies now have to market positions to strong candidates because they essentially can pick where they want to work. A great company starts with a talented staff. As more businesses approach hiring as a team, it’s essential everyone is on the same page with every candidate. If a football coach is trying to recruit a five-star quarterback, his program is going to seem more attractive if his assistant coaches are helping to make that player feel special. And the same can be applied to business — making potential new hires feel special with proactive touchpoints is more likely to win over five-star candidates. Lever Hire blends CRM elements with a full-featured ATS to help companies proactively source and woo candidates, giving companies the ability to reach top talent, even if they aren’t looking for a job. Going beyond the base platform, Lever Nurture is software that sets up companies to succeed with a deeper marketing approach to recruiting, while Lever Analytics gives management teams the ability to make timely, informed hiring decisions through big data analysis. With so many businesses competing for the same high-level candidates, Lever provides that important edge that helps secure the right hires so companies can thrive.